We were challenged, as an audience, to reflect on whether and how one can explore aesthetics of fascism and its culture without forming a value-judgement embedded in grand ideological narratives (and the sweep of 20th/21st century history). It was especially useful, for me, to be asked to think hard about the origins of fascism in grass-roots desires to challenge bourgeois culture wedded to traditional post-Renaissance/Enlightenment aesthetic mores. The paper touched on Hitler’s 1934 problematisation of this association of fascism with ‘the new’ when at Nuremberg, in 1934, modern art was denounced as ‘degenerate’, and we saw some compelling visual editorialisations on the theme via images from the 1937 exhibition of ‘degenerate’ art, complete with satirical titles. The contrast with the exhibition of German art, contemporaneous, at the Haus der Deutschen Kunst, Munich, structurally emphasised the preferred intellectual and analytical trajectory. A contrast between chaos in the organisational scheme for the show of degenerate art vs rationalism inherent in the presentation of ‘German’ art physically channelled particular perceptual responses from visitors. As a classicist I was especially interested in how Fascism came to be at once radical and regressive, with the valorisation of progress and the reclamation of the ancient a central paradox. What this paper gave hints of is the larger project, one which will create hypothetical models (using fascism and classical Greece) which might make possible wider analysis of how classical antiquity is more generally appropriated. I look forward to seeing the methodological framework generated! an understanding of the power of amplification and magnification in staging performances of Greek tragedy to deliver events (or ‘experiences’) which could become vehicles for wider ideological manipulation and realignment. Central to Eleftheria’s proposed, nuanced approach was an emphasis on demolishing a notion of monolithic and directive ideological propaganda at work via these ‘classicising’ cultural events. Instead, we were asked to think about the interlocking layers of meaning which large-scale ‘event’ theatre could make their audiences complicit in (and even co-creators of). The impact on what we should not simply think of as ‘the masses’ was much more powerful and richly experiential and influential than simple ideological propaganda. and very different to the potential offered by cinema. 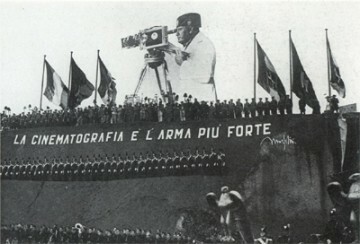 A year after Mussolini proclaimed the power of cinema, L’Unione Cinematografica Educativa (LUCE) was created (1923). This organisation was tasked with producing documentaries and newsreels (in particular) creating a visual narrative, even an ongoing montage, or the technocratic and successful state. With this in mind, I was fascinated to see how Italy (the example used was Syracuse, 1914, and Aeschylus Agamemnon) grabbed the ‘Greek’ monumentality of what was once (as late as the early first century BCE) vividly post-colonial Magna Graecia, and made it serve a very newly national agenda, but at a local level. The aristocratic and popular genesis of this movement in Syracuse (Istituto Nazionale del Dramma Antico) was starkly contrasted with the 18 BL performance on the Arno, including powerful sound and light effects; the hero was in fact a “machine”, and heavy emphasis on technocracy didn’t catch the popular imagination (even in the different cultural world of Italy’s wealthy north). There was much more to the evening’s discussion than I’ve summarised, but from the point of view of teaching a class on Rome this year (‘The Eternal City’, in which we are tracing the historical eddies catching onto the idea of ‘Rome’ and briefly or more deeply integrating them into iterations of modernity from the medieval world until the 20th century), these were the things that especially caught my attention. The key thing, perhaps, is that the deeply communal aspect of tragedy, its ‘populism’ and emotive power (Caesar, Pompey, and the Roman demagogues of the 1st century BCE would have understood vividly) allow and even encourage a people collectively to choose governance-models deeply antithetical to democracy. Maybe. Next Post Ovid’s Garden: Digging!